I went out and purchased a trailer bike for Katie this weekend. At first she was scared when we started out but shortly after not only did she get the hang of it, she loved it! 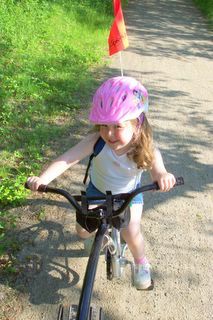 I went to EMS and picked up a few biking things, like a handlebar bag for her snacks which she must always have. 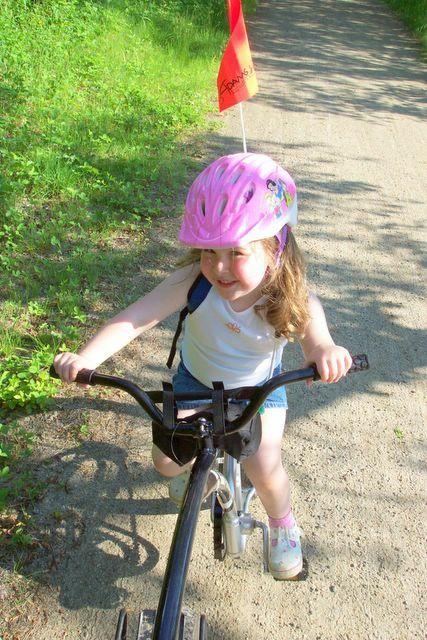 We used to run on a railtrail in Ridgefield where she would sit in a jogging stroller and I would feed her cookies or crackers and she would sip water for the five mile round trip run. We parked at Pepper Street and rode down to the bottom of Great Hollow Lake. We turned around about 0.2 miles from Purdy Hill and then rode back. We went past the car at Pepper Street and rode to the end of the trail which abruptly stops at what I think is the townline. The trail continues but its more single track riding and very narrow with over growth. So we headed back to the car. Our next ride will be the Larkin Trail in Southbury. You will like the trail in Southbury, both ends are fairly level, wide path and generally pretty quiet. There's also a geocache somewhere on the trail.